What do a car salesman and your ex have in common? Chances are, they're probably not your go-to list of people to trust. And do you know what other group of people don't fill us with trust? Marketers. Of course they're going to say their product is the best in the market. This lack of trust has been built up over the years, ever since advertisers and marketing departments began dutifully coming up with fictional stories about their products and creating characters to give their products the edge. But now? Now consumers are wising up to that. "Consumers are getting more astute about news, media and advertising," says 4As Chief Marketing Officer Alison Fahey. Her company carried out a survey with Ipsos OTX which asked people what professions they trusted the most. 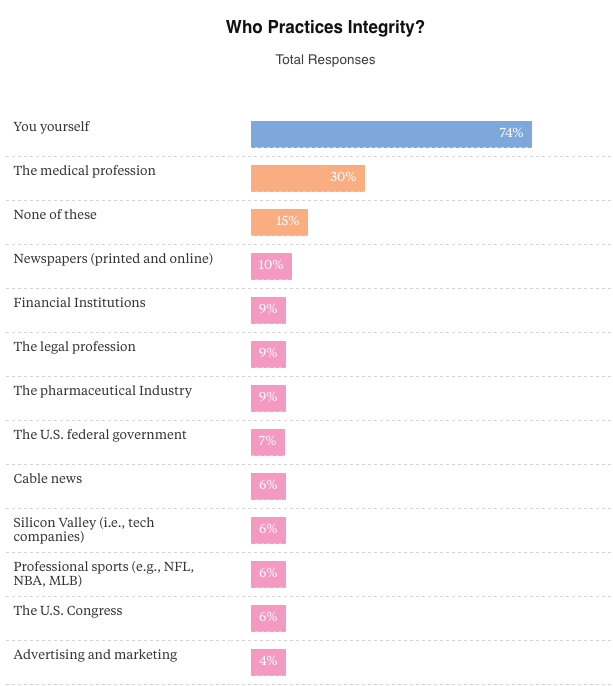 "...we found that only a small percentage of consumers trust advertisers and the media." 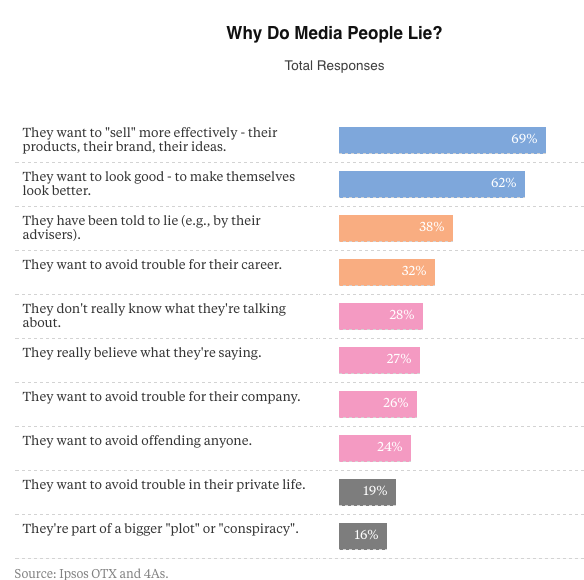 So, Why Do Marketers Lie? For the most part, it's safe to say marketers don't lie on purpose. They have goals to hit and a target to reach, and marketing is their way of telling a story to sell their product or service and reach those goals. The survey below - again by 4As and Ipsos OTX - shows why consumers think media people lie. At the top of that list, not surprisingly, is because "they want to 'sell' more effectively - their products, their brand, their ideas." It's not really, when you think about it. For as long as advertising's been around, the aim of the marketer has been to highlight the benefits of their product and show consumers how it will change their lives - or at least make their lives a little bit better. Think about food ads which promise you'll be 'healthier and happier'. Think about car ads that promise you'll be cooler. Creating narratives around products to encourage people to buy is not a new concept. Special K's ads are all focused on how their product will make you look good. However, the emergence of the internet has allowed consumers to have more choice over what media they do and don't engage with. These days, marketers won't get away with weaving fake stories and highly photoshopped outcomes, because their audiences are onto them. No longer passive receptacles to the media, consumers are now in charge of the marketing landscape - which means teams all over the globe have had to make a huge shift in how they promote and sell their products. Heard that phrase before? Of course you have, and it's no different in the online world. 'Authenticity' is the latest buzzword in the marketing world, but it's likely to stick around. Why? Because in a world where everyone seems to be selling something online for a small buck, consumers crave authenticity and honesty. Take Volkswagen as an example. Back in 1999 (just when the internet-age was really starting to rev up), AdAge released a list of the most influential advertising campaigns of all time. The shocker? At the top of the list was Volkswagen's "Think Small" campaign. The campaign wasn't given the much-coveted top spot because it was catchy or revolutionary or innovative - it was named number one because of its honest approach to advertising. While brands like Chevy were force-feeding consumers the idea that "bigger was better" - especially when it came to cars - Volkswagen took a step back and, amazingly, acknowledged their shortcomings, hence the tagline "Think Small". When you take into account the idea that consumers are faced with more than 5,000 marketing messages a day (yes, a day), it's easy to see why they want to replace those hundreds of sales pitches and thousands of "buy now" visuals with an emotional connection with a brand. So now you know it's not enough to whip up a highly-polished ad, how can you connect with your audience and get them to trust you? Let's dig into four key ways you can get consumers back on side without taking back the new-found power they're revelling in. First and foremost, cut the "me, me, me" spiel. Consumers don't care about you as a company until you give them something to care about - in order to spark a connection with your audience, you have to put them at the center of everything you do. Consider their most pressing pain points and tap into those to offer a real solution that tugs on their heartstrings. Producing and promoting content that merely says why you should "buy this amazing product" or why "this incredible service is the best" doesn't fly anymore - instead, consumers want to know how it's going to help them. They want to know how your product will help them transition from stuck to successful. Create content which offers a solution to a specific problem. For example, if you sell headphones, instead of creating content that touts your headphones as the best (according to who, exactly? ), create content that taps into the emotional wants and needs of your audience. Create content about how music can inspire their lives and how it makes them happier and more aware of their feelings. Note here that the headphones aren't center stage - instead they're the tool which helps the consumer tap into the solution (an inspired, happier life). 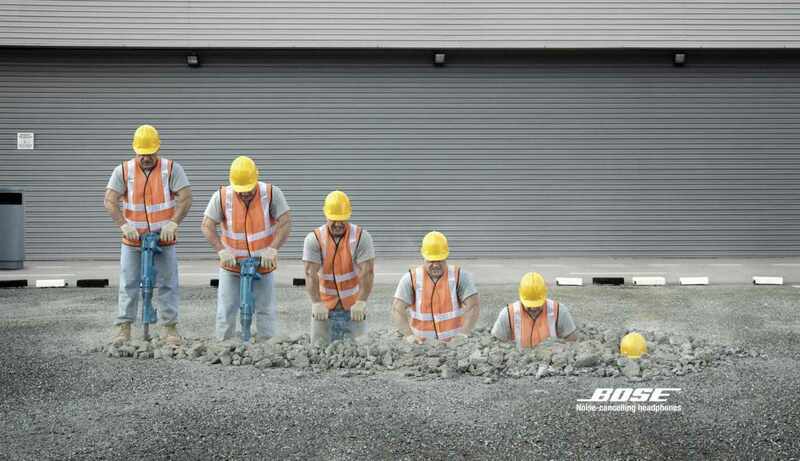 BOSE's campaign removed the headphones from the ad and instead touched on a solution to a specific pain point their customers were facing. It's no secret that people buy from people they trust - but where does that trust come from? Apart from being unconditional between certain groups of people, like friends and family, it comes from being open, honest, and educational. Showing your audience that you know your stuff and understand their wants and needs can go a long way to building that trust. 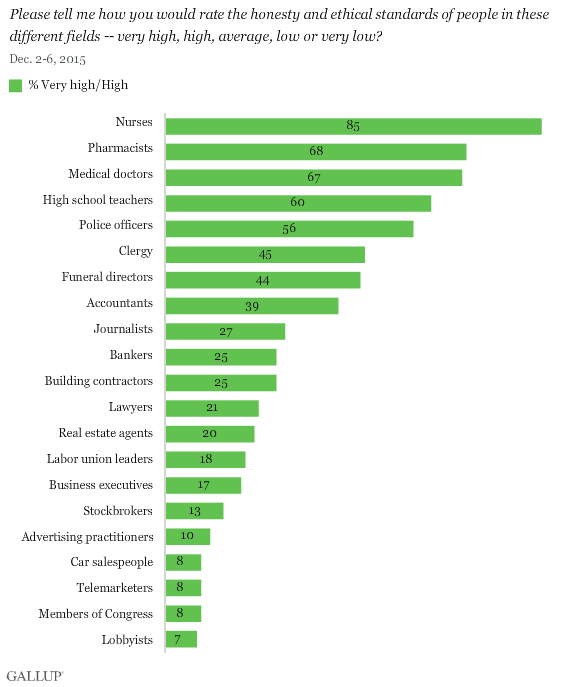 This report from Nielsen shows who consumers trust the most - note the position of ads. If you haven't built up enough authority in your industry, bring in content created by an expert who has. Interview them, ask them to produce a journalistic piece for you, or create a video that showcases their expertise. By proxy, you become an expert because you're offering this valuable information to your audience. Remember here that you're not bringing in experts or sharing established sources to sell - instead, you're doing it to build your authority, to become the go-to brand in your niche, and to show your audience why they should trust you. I spoke earlier about how, for centuries, marketers have been carefully crafting stories that are polished and geared towards the sell. For the most part, consumers are tired of these. These days, they crave real stories from real people that they can relate to and connect with. In turn, they'll connect with you, which is the first step in building trust. User Generated Content (UGC) is the best way to do this. You can encourage past customers and raving fans to share their stories via social media in the form of videos, images, and text. These kinds of stories - straight from the mouths (or keyboards) of your customers - show your audience that you aren't hiding anything and that, if your product has worked for someone else, then it'll probably work for them, too. 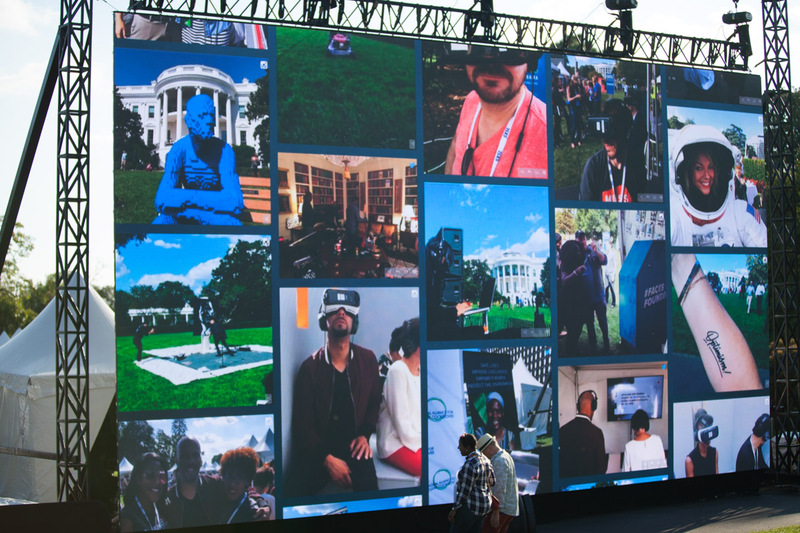 President Obama curated stories from the attendees of his South by South Lawn event, sharing them on a big screen using TINT. Finally, you can bring all the above points together to start building a community around your brand. This is so important in an age where you can pretty much get anything you want or need with the click of a button. An active community can boost your business to expert status, because you have a crowd of people who are willing to shout about your product from the rooftops. These are the people that give your product the social validation you need to build trust with consumers today. Curate UGC to encourage consumers to feel a part of something, create content that's geared towards them and their pain points, and show your expertise. All three of these things will establish you as an authority, which, in turn, creates trust. Now that consumers are in the driving seat of the media they follow and interact with, marketers can no longer continue creating old-fashioned ads that push for the sell. Instead, the landscape is changing to welcome a collaborative approach between businesses and their customers, where UGC helps build community, and trust is the most important factor to apply to your marketing strategies.